This book review is part of series of reviews written by students at St. Margaret’s Episcopal School for their 7th grade English classes. EXTRA! EXTRA! Are LAVA and SKAT at it again? I have never been in the hustle and bustle of New York’s show business but author Jen Calonita, winner of the young reader award in 2009, made me feel as if I was starring in a Broadway show in 2004. Broadway Lights about how a famous movie star’s career on the big screen ends corruptly and is cast in the new biggest broadways show as the lead. She is faced with challenges even some regarding her boyfriend three thousand miles away. This is a story about love, self-confidence, friendships, and deceit. When Kaitlin’s TV drama “Family Affairs” gets canceled, Kaitlin is forced to be the lead in a Broadway show, featuring a teen horror story…. high school. As Kaitlin enters the world of Broadway many people help her along the way, including her rival Sky. Soon, Kaitlin gets suspicious of her boyfriend, Austin’s sneaky behavior and is scared he is cheating on her. As Kaitlin’s Broadway debut ends she realizes how much she loves acting and gets to follow her dream even further. But during the story Kaitlin overcomes many challenges and is a true inspiration to me. This book really showed how change could be good! Sometimes people can be scared for change but this book shows it can end up very positive and you may like it more than what you may have been doing before. As Kaitlin is leaving her movie premiere she realized she was leaving, “The words hit me like a bad review. I’m leaving Los Angeles. My home. Next week. And Austin is not coming with me.” (15) I was super excited to read this book because I am a giant Broadway geek and this book seemed perfect for me. I would give this book an A+ because of the unique writing style it entails. Many parts of the book look like magazine clippings you would read in People or USA Today. This book was by far my favorite book I have ever read. If you haven’t read this book it is a must-read. 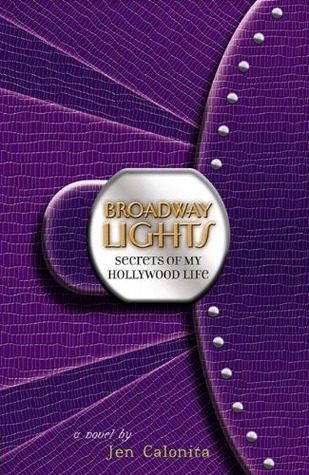 Overall, Broadway Lights is a very fun and well-written book, which will be loved even if you do not enjoy reading. This is a real page-turner, which will keep you at the edge of your seat. This entry was posted in Book Reviews and tagged book review, contemporary, jen calonita by SMES Student. Bookmark the permalink.